It isn’t exactly providing a whole lot of details just yet, but Mitsubishi has confirmed at the New York Auto Show today that its i-MiEV electric vehicle will indeed be making its way to the U.S., and sometime “before 2012”. It hits the roads in Japan this summer but depending on the supply of batteries it might be delayed in its US launch. We just got an exclusive first look at the Peapod from Chrysler’s Global Eco Mobility unit. Like its cousin the GEM, Peapod is a Neighborhood Electric Vehicle, which means it’s limited by law to 25 mph and can’t go on the highways. Peapod gets about 30 miles on a charge, and adds in all the “car” goodies that GEM was lacking. The vehicle seats four in lightweight Arion-inspired seats, has suicide doors for easy entry, a windowed roof that can be removed for some open-air driving, and even a nice amount of trunk space. 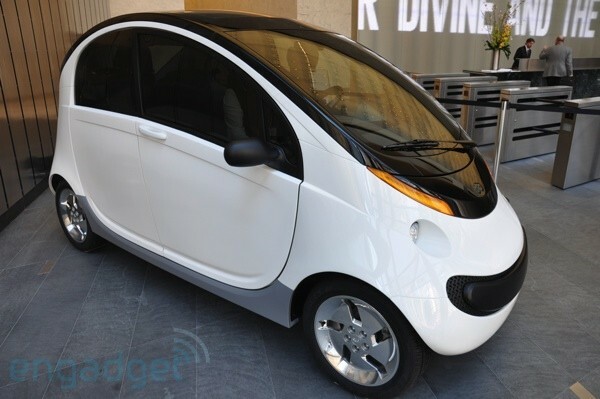 The thing about both of these cars and the Project PUMA from Segway/GM is that running around on the city streets in one of these would scare me to death. Even a low speed crash with someone’s mountain size SUV would not end well for the driver of one of these boxes.